The completed journal from a recent journal swap. I was fortunate enough to be a part of a worldwide journal swap that took place between the members of CoachCreativeSpace.com. Not only did I start a journal that was sent to 6 other artists, but I also had the privilege of creating pages in those 6 artists journals. 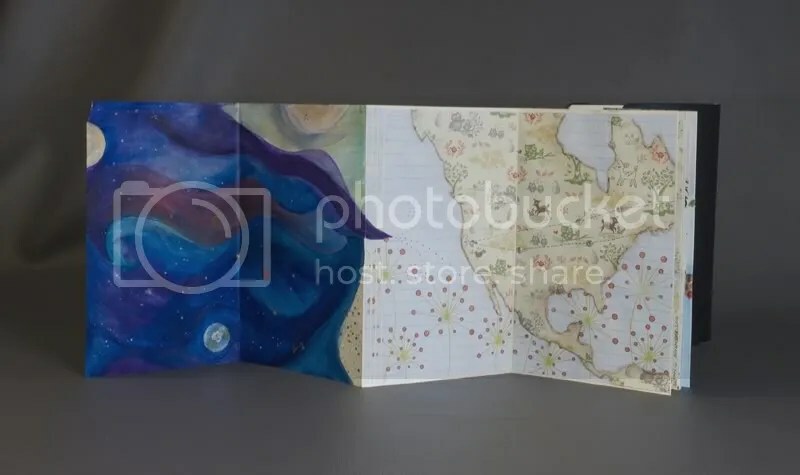 The results were awesome and I feel like I really got to know my artist friends by working in their journals and seeing the work they created in mine. 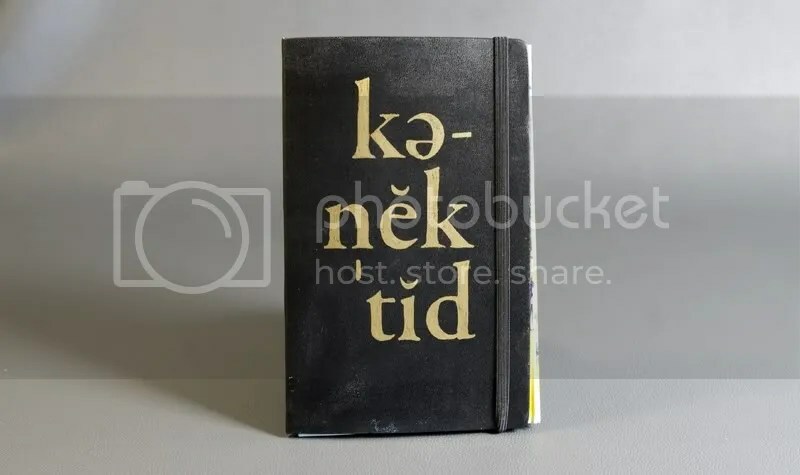 My journal was themed Connected. I chose the theme because eventually, we would all be connected by our work. 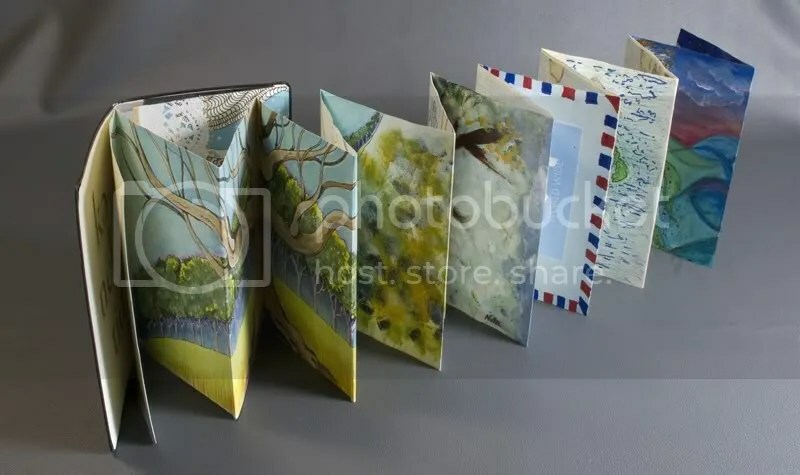 I used a large Moleskine Accordion Journal (Japanese Album) to enhance the theme because its pages are connected, zig-zagging throughout. The only request I made to my artist friends was that they somehow found a way to connect their art to the previous artists. How they did that was entirely up to them. The first 2 pages included the front cover ilustration and a note to my fellow artists. For my illustration, I sketched a marker illustration of a distant treeline with a lone, bare tree. I created my illustration using my Tombow Dual Brush Pens. Since the markers are water-based, I didn’t have to worry about them bleeding through the paper. 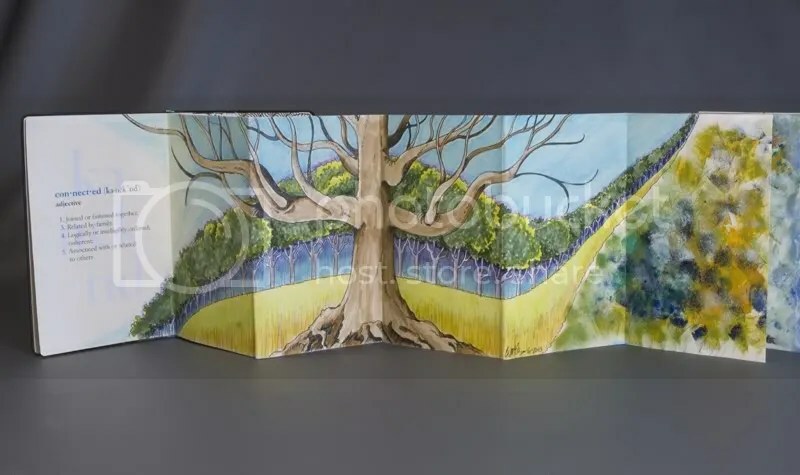 I ended my illustration diagonally, half way through my page and the next artist’s page with the hope that she would start on the empty space on my page, which she did. Nita's connecting images used the same colors that I did to make the transition. Her images were more abstract at first, but morphed into the image of a jet. 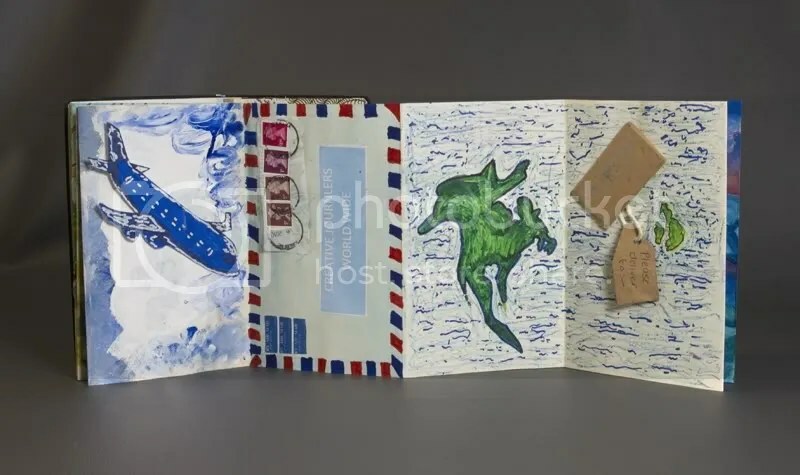 The images following the jet were created by Sue which perhaps were inspired by the journey of this particular journal which traveled to the UK and Canada before making its way home to the US. Sue's post box illustration blends fluidly into the next 2 images by Nancy. The page on the right is the last page of the front side, so Nancy had to continue her illustration on the second side. Nancy had the task of having to create something that flowed in the middle of the book. She had to illustrate the last 2 pages of the front side of the accordion and the first 2 pages of the back side. This is the continuation of Nancy’s artwork from the front side. The next spread shows the journey the journal made, highlighted by tiny rhinestones for the location of each artist. 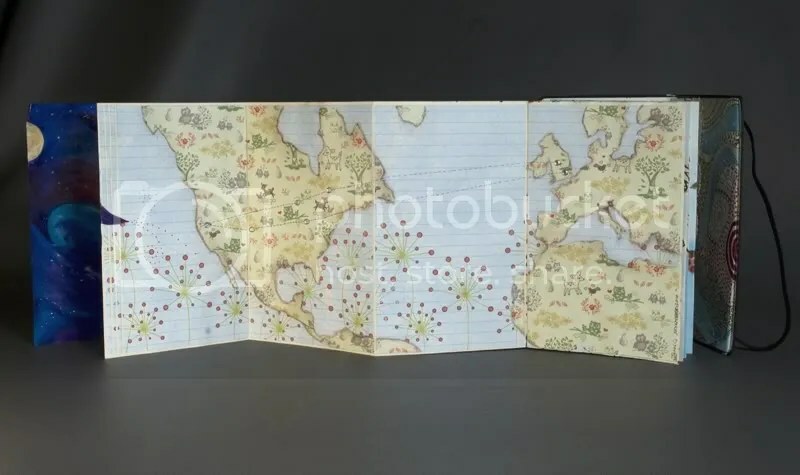 Jean illustrated a map of the journey the journal took to the various artists. You can see more of Jean’s work on her blog, A Joyful Spirit. The next spread continued the dotted graphics from the previous spread, blending with images and names of all the artists involved in the journal swap. Lotus, created an illustration, connecting all of the artist in the swap. 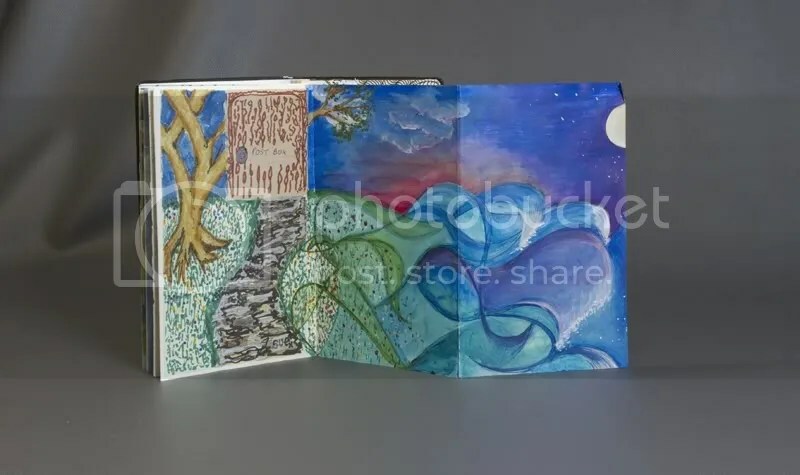 You can see more of her creative journals at her blog, WhymsicalLotus. The final spread in the journal ends with more travel inspired images. Finally, the final spread in the journal features birds in flight illustrated by Paula in New Mexico. 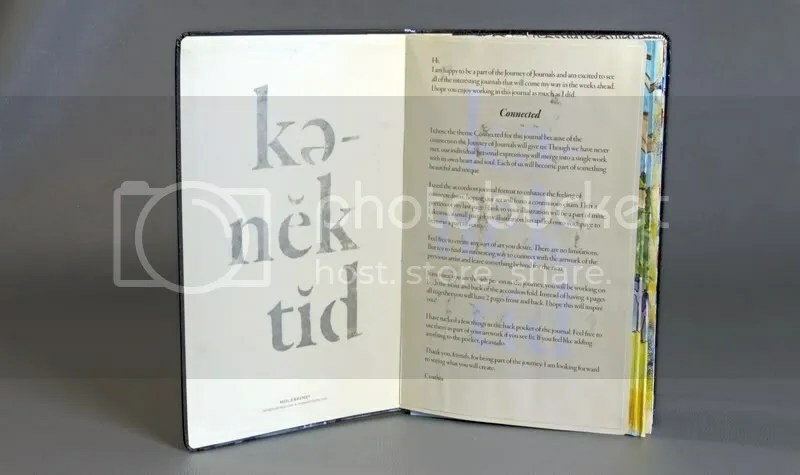 An overall view of the completed journal and its zig-zag pages. 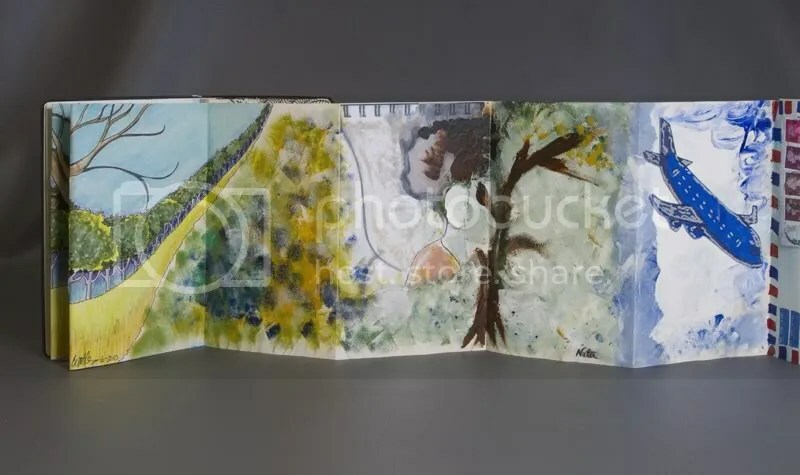 Once the other artists journals are finished, I will be posting some of the artwork I created, so be sure to check back for more art journal images. Hi Cynthia, So glad I came over via your tweet today! Love what you shared here. I love journaling and the creative process that goes with it can be freeing. I love how each page is an extension of the other work in some way! Thank you for visiting, Theresa. I am glad you stopped by. This was my first journal swap and I was very pleased with the entire experience. 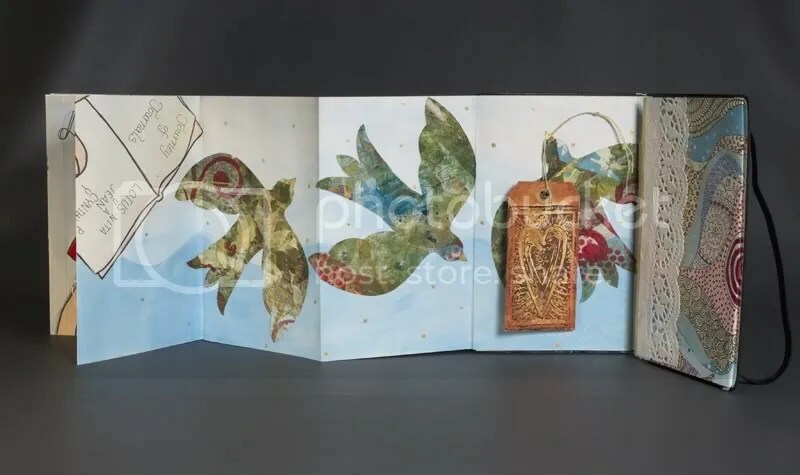 The artists were great to work with an my finished journal is something I treasure. I love your blog and am now following it! Thanks for sharing it with me. 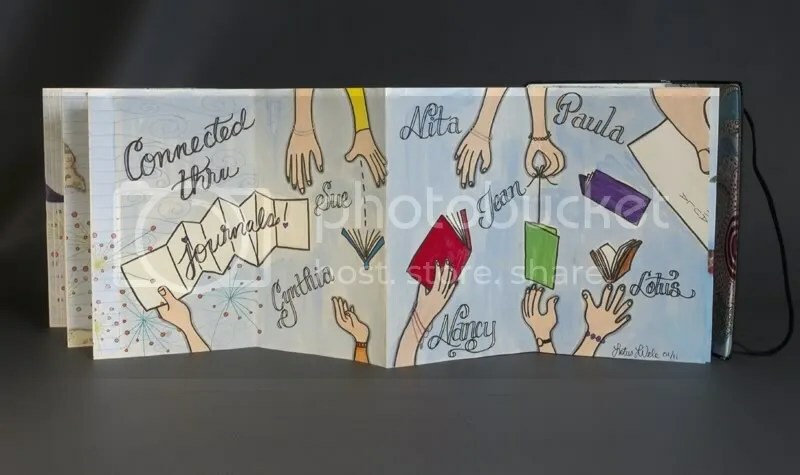 I love this idea – and what stunning artwork! Thanks! You should give this a try sometime, it is really fun. Beautiful! Looking forward to seeing the other pages you did. I hope to post them soon. I have to wait until all the journals have found their way home. I am not supposed to publish photos or it might ruin the surprise for those artist still waiting. I am so sorry to hear that. That must have been really disappointing. I hope that doesn’t keep you from participating in another exchange. This exchange took a lot longer than I expected, about 9 months and I was one of the first to get mine back. I suppose some of the journals might take a year to return home. I’m learning how to properly use my Tombow’s really like them so far. Thank you for sharing this with us. Have fun with you Tombows. I hope you’ll post some of your Tombow creations.